Are you looking for ways and intends to make your windows gleaming again? Do you want to know how to skip unpleasant tasks like window cleaning without lifting a finger? You are in the right place – the experts of window cleaning in North Woolwich will deal with this matter in the blink of an eye. Your windows, their frames and ledges will look amazing, we promise that! You will no longer need to give up your free time – the results of our work will absolutely delight you. Our services combine top-notch quality with reasonable price rates, so don't wait – request an estimate now to save time, effort and money! We also provide our professional services in nearby areas: Victoria Docks, Custom House, Canning Town, Beckton, Silvertown. We promise that the windows of your business premise will be neat and sparkling, like newly-purchased. Accomplish that by just requesting our commercial window cleaning. For glass surfaces up to the fourth floor, we utilise water fed extension pole equipment which is totally safe and effective. London is famous for it's tall buildings. So when it comes to those highly-placed windows we will call on our rope access squad. With this sophisticated technique, we can give you finish surpassing any other! We provide private and business window cleaning by using sophisticated approach. You can rely on our expertise for all types of glass surfaces, roof windows and greenhouses. For windows placed up to the fourth floor, we use water-fed extension poles. This procedure is handy and allows risk-free cleaning systems – the poles are attached to the water reservoir in the vehicle. For high-rise windows, our rope access team will grant you quick and efficient end results. You can gain a lot from these methods right now – just ring 020 3746 3113 and book a window cleaner! You can depend on the cleaners for both household and business window cleaning. Every type of glass surfaces are included in our professional practice. For instance, you can get a service for cleaning small or double windows, sash ones, French doors, patio doors and bay windows. In addition to these, we wipe and polish garden window surfaces, conservatories and roof glass. At home or at your workplace, you can always have crystal clear glass surfaces – just call us! We have the right skills and the right equipment for the assignment. 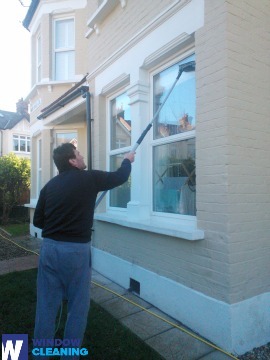 You will have sparkly clean home after the professional window cleaners in North Woolwich visit you. We deliver great services for the entire London locality. The leading methods are included in our working practice – including water-fed extension pole system and and hard pressure cleaning. You will see for sure the change of your home's entire look – we use purified water for the process of inside and out window washing. Contact us now on 020 3746 3113. Our customer representatives will guide you and answer your queries. Or you can use our on-site booking from. The nearest tube station serving E16 North Woolwich is King George V.